And there's also this: "It turns out global warming causes private jets". Make sure you check out some of the other comments at this link; a few are tremendous! [hts: drudgereport; instapundit]. Global temperatures rose through most of the 20th century, about 0.9 degrees Celsius. But for nearly the last 18 years, global surface temperatures have flatlined. 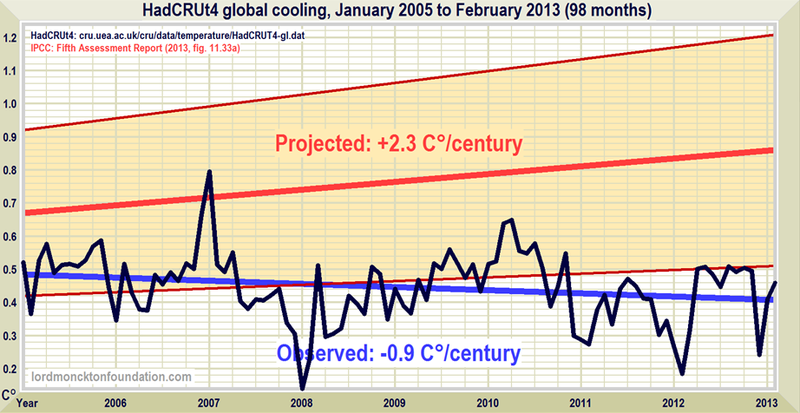 In fact, some satellite measurements have even indicated a slight cooling trend. This has happened despite humans spewing out more than 100 billion tons of carbon dioxide into the atmosphere since 2000. To put that figure in perspective, humans have emitted roughly 400 billion tons of CO2 into the atmosphere since 1750. So a quarter of all human emissions since the start of the Industrial Revolution have occurred this century. And yet …no warming since “Titanic” came out. This is good news, Leo! You can take your private jet from LA to New York even if all you want is a slice of pizza. That is an awful convenient stance for a guy who owns at least four homes, took a private jet to New York, arrived at the rally in a limo and likes to party on an eight-story, 500-foot-long yacht that he rents from … wait for it … an oil-soaked Arab billionaire. I kid you not. Click here to read the entire entertaining post.